This entry was posted on April 26, 2016 at 10:32 pm and is filed under Entanglement, Foundation mathematics, Foundations Of Physics, Mathematics, Non Locality, Uncategorized. You can follow any responses to this entry through the RSS 2.0 feed. You can leave a response, or trackback from your own site. Awesome. Just awesome. So you are not the solitary weirdo out there anymore? What is this Massimo punk gonna say? You know the big time philosopher guy in New York who banished you for telling the truth about English philosophy? Let’s cut the chase. Could you give another overall description of your sub quantum mechanics? Thanks. Philosophers are paid for offering the blue, and red pills, as Brodix said. 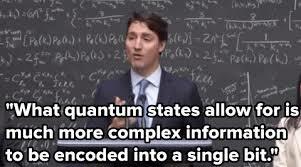 As progressive and informed as the pm of Canada is, he is not a physicist. Progress in QC is occurring; You seem to be emptying the baby with the bathwater. Hi 1truegarcol. Thanks for the quotes, very nice. Wineland got the Nobel with Haroche, but Haroche’s work was more sci-fi… Entanglement/Nonlocality are the core of the Quantum. Trudeau told, very well, the basic idea. I also know that computations with a few qubits have been made with a variety of devices. I don’t thing they can compute 4 + 4 yet. And I know that D wave sells a (controversial) 12 million dollars “quantum computer”. This article to be published for the next issue of the AMS espouses, nevertheless, what has been (much of) my position for well over a decade or two. This is why I believe progress in physics will come from the quantum computer. It already does, from astronomy (as usual). I also believe that quantum simulating devices (basically interference devices) should be very useful. All I say is that a full mastery of a full quantum computer would require SUB QUANTUM PHYSICS. This essay in the AMS is the first article supporting that viewpoint I am aware of. Yet what problem would you put this computer to solving? It is not as though nature isn’t its own computer and humanity along with it. Is there some question which will take raw computing power to solve? The fact is that the answer is whatever survives the process and human civilization seems to be on a path to self destruction. As Russell said of war, it doesn’t decide who is right, only who is left. Does it take a computer to figure this out and how to solve it, or is there some other problem? As I see it, the focus on computers is another process of deification. If you see it as an end in itself and not a tool to a further goal, then you make it a god. It is not as though there are not a universe worth of complexities we could model and understand better. The question is whether this helps humanity to survive and thrive, or is it just more toys in the toy box. There is a bit of a Tower of Babel syndrome with all our advancing knowledge, in that as we all press forward with our particular goals and ambitions, what is there that holds us together? In earlier times people had a better understanding of how much they needed each other and they were likely far more self sufficient than most people today, but we, in our protected spaces, are fed this idea of the individual as master. Which is very useful for those in charge, as it validates their individual power, while keeping the larger society atomized. So are ever more powerful computers going to solve some of these elemental issues, or be used to enforce them. Say the NSA gets a quantum computer. What do you think it will be used for? War: we are left, so we were right. Quantum Computer: what we need for Artificial Soul. Artificial Soul? AS? Beyond AI? isn’t the real soul what pulses through the body and intelligence is the effect of it processing feedback? So we assume that if we process information, it will become conscious? Rivers and stream process information, as feedback from everything from gravity to obstacles. Wouldn’t that give them consciousness? No? That would be anthropomorphizing and deification. So why would a machine designed to read quantum state be conscious? Is it a tool, or a God? If I use a hammer to strike a nail, I am imbuing it with my own consciousness, as it becomes an extension of my hand, but truly manufacturing sentience and not just extending it, seems well beyond our current abilities. It does seem to be something giving rise to intellectual complexity, not a product it. Possibly we will start constructing computers out of biological material. Then we might have reason to worry about sentience and tools with attitude. However modestly, the Quantum is intrinsically intelligent. That’s probably the most shocking part. Consciousness effectively functions as energy, always seeking to expand, grow, escape, push the boundaries, seek out the most efficient route. Intelligence is the accumulation and storing the memory of this process.